Today would have been Ernst Collins' 128th Birthday, and the past year has been a busy one. 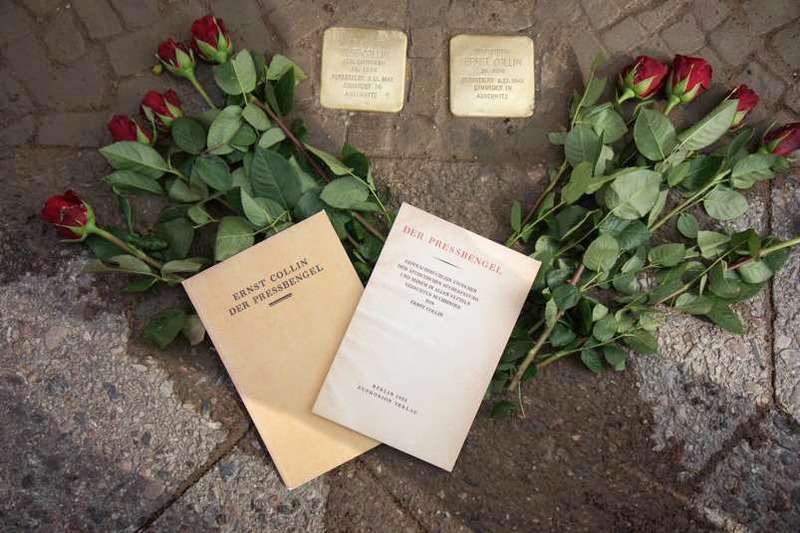 Based in part on work done to disambiguate him from "the other Ernst," Ernst Collin-Schönfeld, we were able to honor his memory with the dedication of Stolpersteine for him and his wife on 4.1.2014 in front of his last chosen home in Berlin-Wilmersdorf. An corrected and expanded biography of Ernst and his father and grandfather based largely on articles by Ernst was written to accompany the Stolpersteine. His bibliography has grown to over 230 articles not just about bookbinding, but also art in general, economics, and politics. Also found were references to publishing on bookbinding by his sister Gertrude Kampf-Collin who took over the family firm. This also included helping correct his "name authority record" in the catalog of the German National Library. A fine press edition of my translation of Der Pressbengel (The Bone Folder) with the corrected/expanded biography will be published by the Boss Dog Press with work beginning during the fall. A bibliography with corrected/expanded biography is in preparation and will be made available in German and English as POD and online. The NPO "Research Society for Book History and Conservation" in Nara, Japan is preparing to translate The Bone Folder into Japanese, something I very much look forward to working on with them. In other "family news" I was able to discover 135 titles bound by the firm of W. Collin in the catalog of the Syracuse University Libraries, and all in the v. Ranke Collection. This was indicated by a note that said "Binder's label: W. Collin." and 3 cases "Binder's label: W. Collin, K.K. Hofbuchbinder, Berlin." All articles relating to Ernst Collin and his family have also been group via the Collins link at the top of the left sidebar.